“IVANHOE, perhaps Sir Walter Scott's most popular novel, was the perfect choice for historical opera and launched by D'Oyly Carte's ambitious English Royal Opera (now home to the Palace Theatre) where this romantic opera of three hours ran with a double cast in one of London's largest and most expensive theatres, on consecutive nights, for 155 performances. IVANHOE was written when Sullivan was at the height of his powers, with his typical fluency in word-setting and mastery of orchestration, and it breathes his natural empathy and humanity. 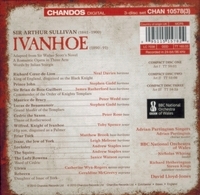 This is the first professional commercial recording of IVANHOE and features a fine cast. The recording is dedicated to the memory of Richard Hickox who was instrumental in getting the project off the ground. Arthur Sullivan's IVANHOE is among the most prominent works on the list of operas that almost everyone has heard of, but that almost no one has heard. 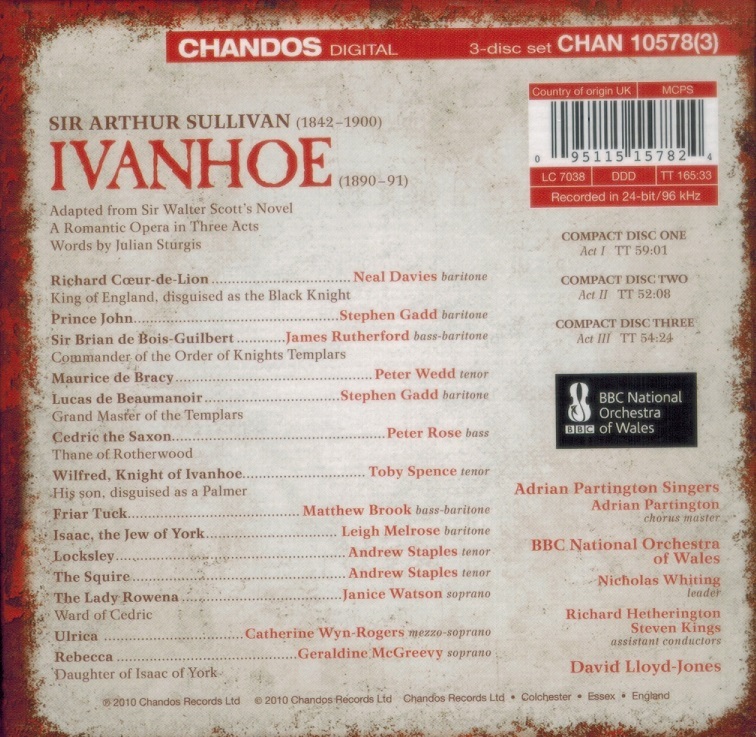 While IVANHOE is certainly not going to find a place in, or even at the fringes of the standard repertoire, this recording should go a way toward putting to rest the platitude that England was an arid operatic wasteland between DIDO AND AENEAS and PETER GRIMES. Lloyd-Jones leads the opera with loving attention to detail and to its dramatic arc, drawing committed performances from the orchestra and chorus. All of the soloists are very fine and several are exceptional. Chandos' sound is clean and present. IVANHOE should be of strong interest to fans of late Romantic opera." "Sullivan's tuneful score makes for pleasant listening in this recording, planned for the late Richard Hickox, but stylishly conducted by David Lloyd-Jones. A fine British cast is headed by Toby Spence and Geraldine McGreevy, with James Rutherford as the lustful baddie." "Here at last is a recording...that makes the best possible case for the opera. David Lloyd-Jones conducts with an ideal balance of swagger and lyricism....Anyone who enjoys the serious side of Sullivan, as in THE YEOMEN OF THE GUARD, will find much to enjoy here."